Apple trees are native to a cold climate, and there is a rich history of pasty white northern natives getting a whopper of a sunburn the first time they ventrure into the Southern California sun. 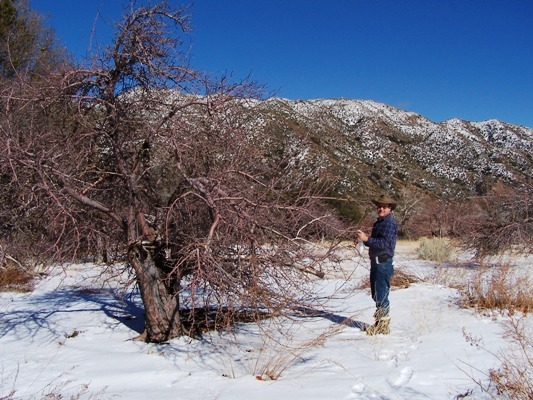 It can hit well over 100 degrees F here as early as April, and many of the apple trees are not fully leafed out yet. This leaves the bark exposed to the direct intense sun, which can kill it as seen above, almost invariably on the southern side. 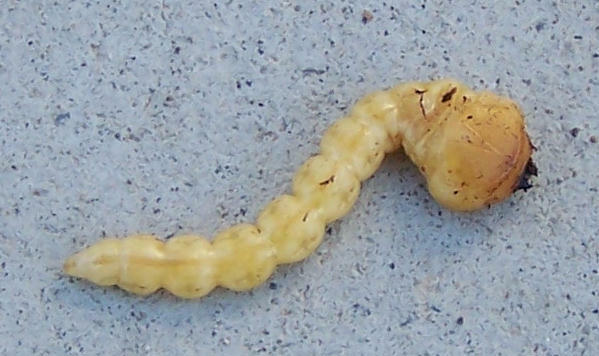 The damage is not readily apparent however, except to a nasty worm pictured below called the Pacific Flathead Borer. The adult beetle has a knack for finding this sunburnt bark and laying an egg on it. The grub hatches and eats through the botton of the egg and into the sun-damaged bark, which can no longer “sap” out the invader. It then proceeds to the edge of the healthy bark to feed on the cambium layer, tunneling along and leaving a trail of sawdust under the bark. If it makes it all the way around the young tree, it will girdle it and kill it from there up. The preventative remedy for this is to apply a layer of sunscreen in the form of white latex paint diluted 50% with water. Paint the whole trunk, paying special attention to the southern exposure, the graft union near the ground, and the tops of any exposed branches that will get direct sun without leaf cover. Folks in northern climates also do this, but for different reasons; they do it so that the winter sun does not prematurely thaw a section of bark to start the sap flowing, which will freeze and burst in a cold spell. We’ll cover more on finding the borers in a later post. The tropics of Africa do not have seasons like we know them; instead life is governed by the rainy season, which consists of the short rains and the long rains. The long rains in Sierra Leone start in June, and that is the planting time also if you expect your trees to live through their first year. Shipping via air freight can still take between 8-14 days and they may spend some time in a sweltering tropical cargo warehouse, and so it is best for the trees to be dormant; but where do you find dormant Anna and Dorsett Golden apple trees in June? 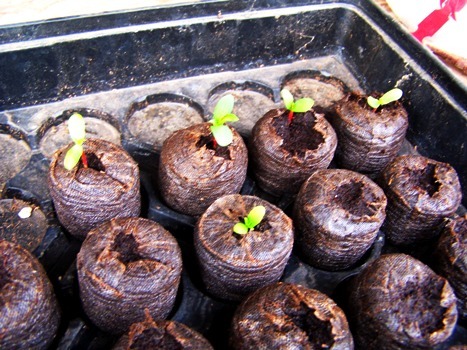 My strategy is to sprout apple trees from seed in January, bud graft them by late April, strip the leaves in mid-May, and refrigerate them for two weeks before shipping. In order to do this I have to sprout them in a mini-greenhouse over a heat mat, and also give them a few hours of extra light with a grow-light. We’ll see how they do out in the garden bed with cooler soil temperatures (in the 60’s). 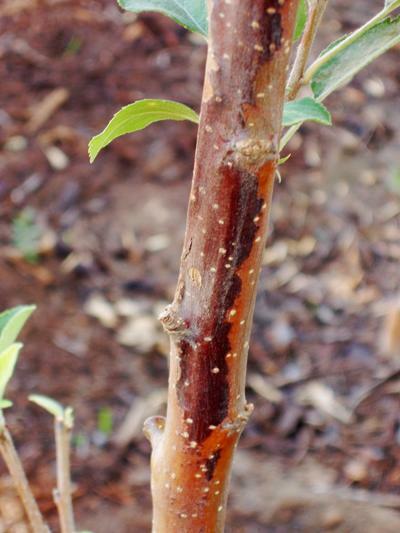 EMLA 111 apple rootstock has resistance to wooly aphid, a major pest in parts of the world that can cripple apple trees. 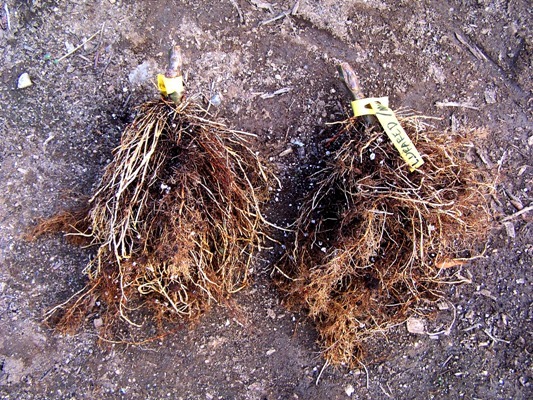 But to get more of this rootstock you cannot just plant seeds from it; it must be cloned. An easy way to do this is with a stool bed, and this example shows how to do it in a pot. Last year I allowed an EMLA 111 rootstock to grow up in a pot and then cut it off at ground level. As the roots started sending up shoots, I put a bottomless pot on top and started filling it up with a mixture of peat moss and perlite (sawdust works well also). What resulted is that the shoots rooted into the peat quite nicely. While they were growing, I also bud-grafted each shoot with the desired variety. Taking advantage of the beautiful weather this afternoon I pulled the top pot off and raked back the peat, exposing the rooted shoots. I dug down and was able to get the clippers under the root mass, and cut the two shoots free from the parent roots and potted them up. 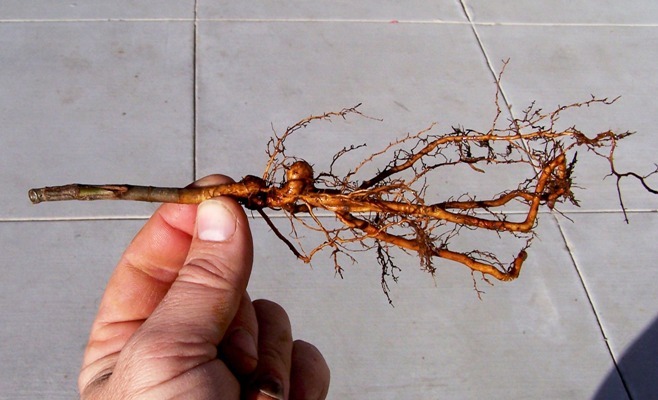 The potted parent roots will continue to produce rooted suckers like this every year. I ended up with two new trees pictured below called “sleeping eyes” because the dormant bud graft looks like an eye. 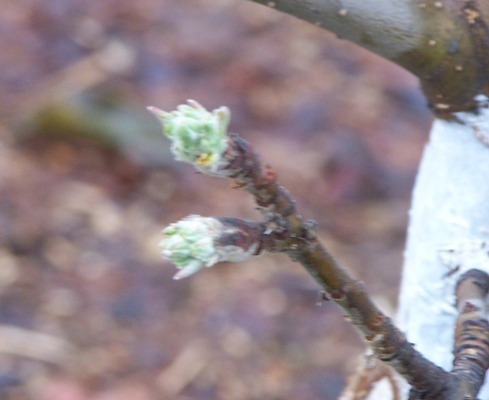 This spring the grafted bud will send forth a shoot that will become the trunk of the desired variety on the new tree, and it will have wooly aphid-resistant roots. Now I can buy these rootstocks already grown for only about 60 cents each, and so I’m not going to go into production; but its nice to be able to show folks in Africa who can’t just mail order them how to do this ancient and useful craft. After a 4-day storm that dumped 5 feet of snow in the local mountains, we were up at Silverwood Lake State Recreation Area today delivering the trees we’ve been growing out for them and taking cuttings from the existing trees for grafting the remaining trees they need for rejuvinating their historic orchard. These trees will consist of varieties grown here and other orchards in the local mountains. We have pretty good documentation both of the varieties and the history of the orchards, and this seems to be the perfect place for them. 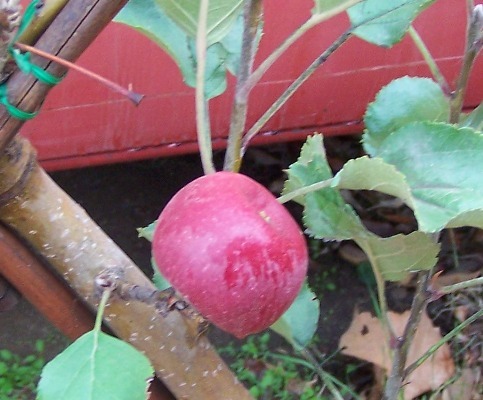 The elevation is in the foothills which receives frost and cold, but still gets summer heat that apples seem to like as it kills fireblight before it does much damage. Ripening here about this time is Cocktail Grapefruit, which according to University of California, Riverside’s Citrus Variety Collection is actually not a grapefruit at all but a hybrid of Siamese Sweet pummelo and Frua mandarin. The cross was made at Riverside, possibly in the 1950s. 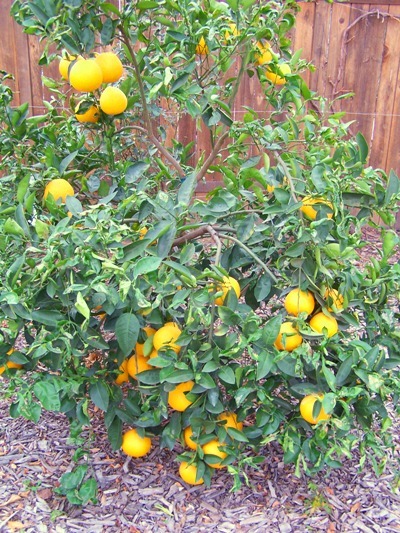 The variety was never officially released by the University of California, Riverside, but somehow made it into the public sector. From the outside it looks and smells like a grapefruit, and it contains a tremendous amout of juice. However it is quite mild, very sweet with almost no acid at all but still with a grapefruit-type taste. A couple of them will give you a decent-sized glass of refreshing juice that’s easy to down in a few gulps. The tree bears heavy crops of fruits that need to be thinned or they will break branches off the tree. Color is not a reliable indicator of ripeness, and it is not uncommon to have a greenish tint to the thick rind even when fully ripe. They hang well on the tree but dry out a bit if left too long. A nice substitute for folks who enjoy grapefruit but have stomach problems because of the acid. You probably won’t find them in stores, so you’ll have to grow your own. The Dorsett Golden tree budded overnight. I know this because just yesterday I stripped the rest of the leaves off of it, and nothing was happening. Today I decided I better cut the scionwood from it, and to my shock there was a dozen branch tips swelling with the unmistakable green of leaf tips (Dorsett Golden sprouts leaves first, then blossoms against the green background). I checked the Lady Williams tree, and sure enough, they still aren’t ripe; I figure about another week or two, meaning once again we have apple season overlap. Speaking of seasons, just a week ago I was whining about needing rain; today the skys have opened up and we’re getting hammered with a warm, steady downpour typical of El Niño storms. While we’re sitting around waiting for Lady Williams apple to ripen, I’ll review some citrus that is just starting to ripen here, starting with Nagami Kumquat. 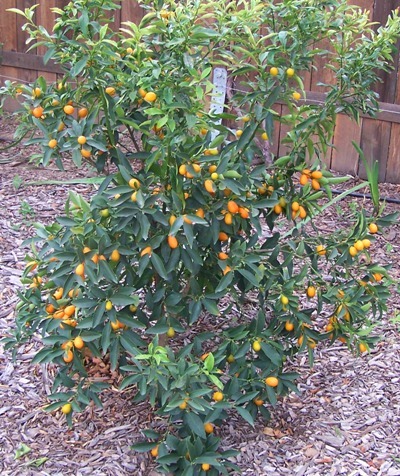 Kumquats are eaten whole, and the skin is very sweet while the juice is tart. If you’re not fond of such tartness, the strategy is to bite the tip off, squeeze the tart juice out, and then eat the pleasantly sweet-tart flesh as one bite. We’ll take these backpacking, as they pack well and you don’t have to mess with peeling it; they are a welcome change to the dried fruit we usually have. On Flying Dragon dwarfing rootstock, the minute trees can be kept on the patio in a large pot, and the fruit hangs on well on the tree for months. Last year a wayward truck knocked all the fruits off our tree, and so we’re happy to finally get some. 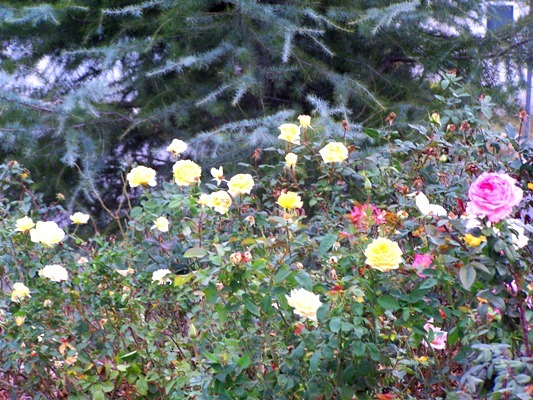 The roses have hung on a long time this year; I took this photo this morning as it may be the last of them. Our balmy, mild weather is due to come to a crashing end next week with the arrival of a string of El Niño-driven storms that threaten to dump 6 to 8 inches of rain in the valleys and feet of snow in the mountains. Hard to believe it today, as it was blue sky and about 74 degrees. Rain like this may be common in other parts of the country, but we often only get six inches of rain all year, and so it could be devastating to us. The main danger is in the areas in the mountains and foothills that burnt this year, as rains like this can turn dry canyons into flows that resemble brown wet concrete that sweeps cars, houses, and bridges down to the ocean. However we really do need the snow, as a good snowpack melts into the ground slowly recharging underground water tables and is our insurance against drought. One other strange benifit is that heavy, extended rains act the same as chilling hours, giving excellent crop sets in the San Juaquin valley. It is not fully understood why, other than something is washed off the trees that make them think they’ve had a cold winter. The last time this happened was 1995, after an almost tropical winter with very warm temps and heavy rains had farmers terrified of erratic fruit sets; instead, records were broken with heavy crops all around. We can only hope for the same this year. 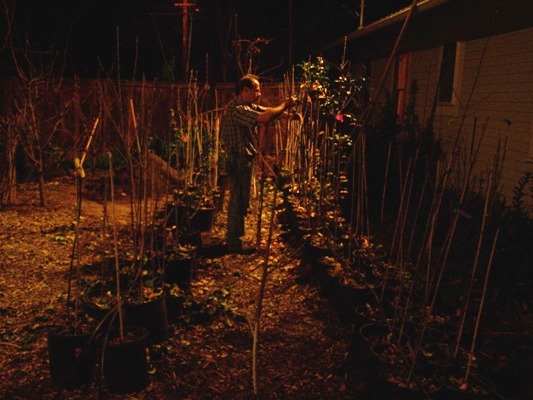 OK, its not exactly midnight, but I’m still out working well past dark under the spotlights trying to get the potted apple trees ready to send out to schools to free up my time for the grafting mayhem that’s about to start in about a month. I’m happy for the good weather but we really could use some rain. 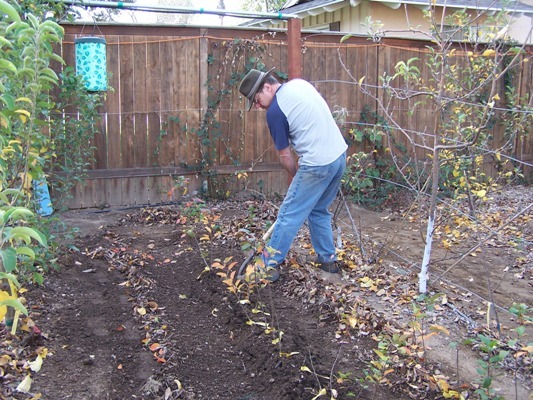 Today was the day to dig up the seedling rootstocks I started from seed back in June. 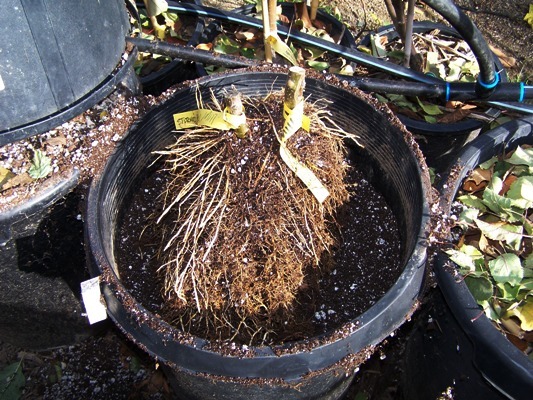 I bud grafted them back in September when they were still only about 3/16″ in diameter, and every single graft took. This little guy is a complete apple tree; if you look closely at the top on the left hand side you will see the bud graft. These were grafted with Anna and Dorsett Golden, and will be refrigerated for a couple weeks and then shipped to the tropics to become starter orchards and supply scionwood for further propagation. As you can tell they will be cheap to ship, and with no graft to heal and a seedling rootstock pushing it, they should grow like a rocket. Anna and Dorsett Golden will fruit the second year even on seedling rootstock, and so they will at least get a few apples to whet their tastebuds next year. 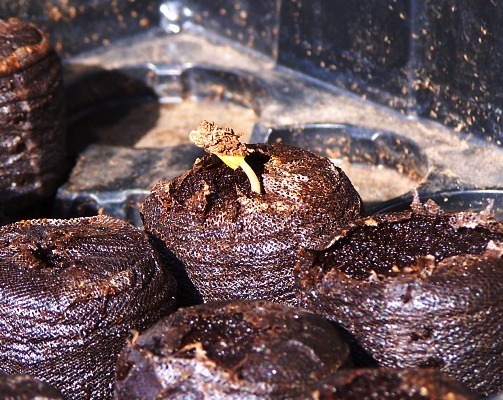 At the same time the first seed from this year’s batch sprouted today, which means I’m able to successfully propagate rootstocks year round in order to ship to tropic countries to hit the start of their rainy season, typically the best time to plant.